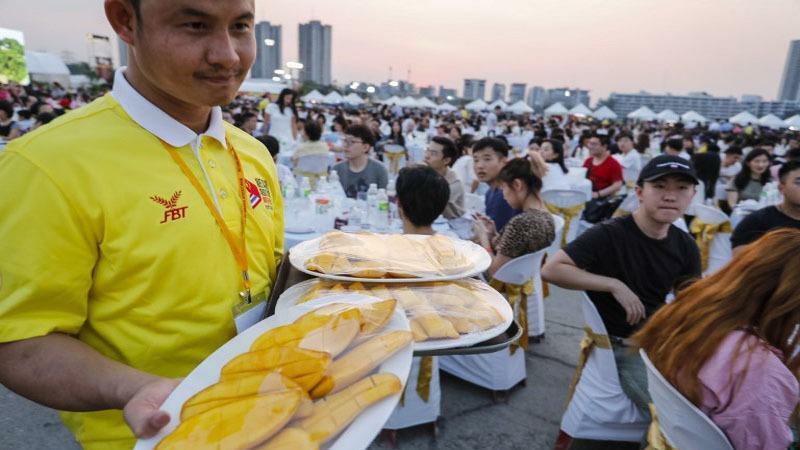 BANGKOK, Jan. 21 (Xinhua) -- Some 10,000 Chinese tourists have been invited to a feast in Thailand that has broken the Guinness World Record for the biggest sticky rice mango banquet ever, as a way to win tourists from China back. The dessert, featuring 6,000 mangoes and 15 tonnes of sticky rice was announced the world biggest one in an event themed "We Care About You" near Bangkok. The feast was held on Sunday by the tourism panel of the National Legislative Assembly and was coordinated by the Association of Thai Travel Agents. Chinese tourists were invited to enjoy the most famous Thai dessert along with Thai food and fruits as well as Thai-Chinese performances. Chinese arrivals, which were booming in early 2018, were stunted by a deadly ferry sinking in July 2018 which killed 47 Chinese tourists. Although yearly arrivals of Chinese tourists for 2018 exceeded a historic milestone of 10 million in December, monthly arrivals were lower than that during the same period last year. Thailand have exceeded the waiver on the on-arrival-visa fee for 20 countries and regions including China, the kingdom's biggest tourism contributor that accounts more than a quarter of its international arrivals.